Contemporary Art Jugs by Ceramicist "Galea Belinscaia"
Galea creates individual pieces in clay, using only traditional clay sculpting techniques. 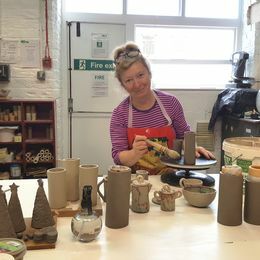 Each piece takes several weeks to complete because the process involves hand shaping and modelling before natural air-drying at room temperature, then glazing, kilning, polishing and finishing. This guarantees each piece of work is unique and will never be exactly replicated. Her influences are several, and include classical forms and shapes, tribal art, the natural and the organic world and how she might read faces. Galea's figurative work can have a wistful and wry aspect to it and often incorporates humour, exaggeration and the grotesque into these pieces to offer observations on the world around her. Galea is particularly interested in elevating everyday domestic items such as bowls, vases and jugs, by exploring the boundaries between their function as everyday objects and their aesthetic as works of art.